Mark and Mia Schand, at their home in Windsor, Connecticut. In fall of 2013, Mark Schand walked out of court in Springfield, Massachusetts, a free man – after 27 years in prison for a murder he says he did not commit. Two years later, Schand is still getting his bearings. He’s living with the wife who stood by him — and is trying to find a way forward with little help from the system that locked him up. His wife Mia – who’s 53, with long, black cornrows and bold silver jewelry – is wearing the same shirt. It was printed by Centurion Ministries, the advocacy group that helped get Schand out of prison. He’s referring to October 4th, 2013 – the day a judge vacated Schand’s 1987 murder conviction, granted a new trial and let him go. Mia can still hear the cheers of about 100 friends and relatives in the courtroom, including Schand’s three sons and two granddaughters. “It was so overwhelming that it finally happened,” recalls Mia. That was the day Schand first saw the house where Mia raised his youngest son. And where he ate his first non-prison food in more than a quarter century. Within two weeks, the Hampden County District Attorney decided to drop all charges – and Schand could start his life over. Mia taught him to drive again. “It was like teaching a teenager,” she says. He learned how to use an iPhone, opened a bank account. Yet, Schand did not consider this a new life so much as a return to normal. In 1986, Mark Schand was 21, living in Hartford with Mia, who was pregnant. He had two older sons with an ex-girlfriend. He says he was weeks away from opening his first clothing store when he was arrested. According to court documents, a drug deal near the After Five nightclub in Springfield had gone bad. A man fired shots, one of which killed a 25-year-old bystander, Victoria Seymour. A witness testified that Schand was the shooter, though Schand claimed he was nowhere near Springfield at the time. His lawyer, John Thompson, spent decades trying to prove that witnesses lied, and that police and prosecutors coerced testimony and manipulated line-ups. It took investigators from Centurion Ministries — a New Jersey organization devoted to freeing the innocent — to finally convince the court Schand did not get a fair trial. Schand says years of bitterness evaporated in a moment. That has turned out a lot harder than Schand expected. For one, he’s not eligible for any re-entry services from the Massachusetts Department of Correction. Only inmates who’ve served their sentences and are on parole get housing assistance, job training, counseling and financial advice. A state spokesperson confirms this; once charges are dropped, you’re out of the system. Schand did file a legal complaint in early 2014 with the Massachusetts Attorney General, asking for restitution – the maximum is $500-thousand. His lawyer says they hoped for a quick settlement, but now have to prove in court he was wrongfully imprisoned — a long process. In the meantime, Schand has been on his own to find work. His wife Mia, who works as a hairdresser, tried to keep up his spirits. His first break came, he says, when he applied in person for a job at a group home for troubled kids. A manager asked why he left the previous-employment section blank. Schand worked there for 7 months, he says, until he was laid off. He got his job at UPS because a friend put in a good word. It’s a brutal shift — starts around 3am, emptying tractor-trailors full of heavy boxes. He gets just under $11 an hour, and expects to qualify for benefits soon. But it’s not what he wants to do. When he was a teenager, his father, an entrepreneur, taught him how to run a business. Before his arrest, he’d hoped to put those skills to use at his first clothing shop. At this point, he’d settle for owning a fast food franchise – if he can ever build up enough credit to get a loan. Until then, the Schands try not to obsess over what could have been. But they don’t hide Mark’s story either. “26 years, 11 months, 4 days, 20 hours, 26 minutes, and 8 seconds,” he reads. 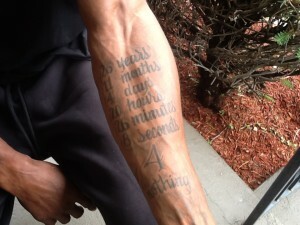 Mark Schand’s tattoo of exact amount of time spent in prison. In several pictures, he’s got his arms around new friends he met through Centurion Ministries — most of them fellow exonorees, as he calls them. Representatives for Springfield and Hartford say they don’t comment on pending litigation. The lawsuit is likely to take years.